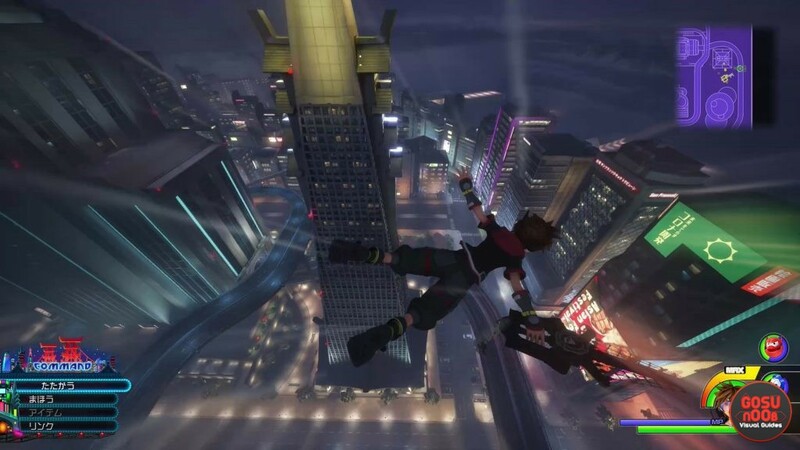 Lucky Mickey Head Emblems in San Fransokyo in Kingdom Hearts 3 are hidden collectibles strewn across the map. As is the case with other worlds, San Fransokyo Lucky Emblems are stowed away in the strangest of corners. It’s up to you to find them and photograph them. However, some of the San Fransokyo Mickey Head emblems are really difficult to find. In fact, some of them even show up only at a certain time of day, while others require you to climb to places you’d never dream of going. To help you out, we’ve put together this Kingdom Hearts 3 San Fransokyo Lucky Emblem Locations to show you exactly where to find all 11 hidden Mickey Heads in the Big Hero Six world. Hiro’s Garage Lucky Emblem Kingdom Hearts 3 – Where to Find? Finding the Lucky Emblem is Hiro’s Garage in San Fransokyo, is pretty easy. That is, if you know where to look. The Mickey Head is painfully obvious, and yet quite possible to miss. So, how do you find it? Stand in the fast travel point, and look to the right of the little Kupo in the corner, then look up. The Lucky Emblem is formed by the yellow cables. To find the second lucky emblem in San Fransokyo, start from the third spawn point. Look way above you, to the bridge from which the lanterns are hanging. In the corner on the right, you’ll see a point to which you can teleport. Get up there, and clamber onto the bridge. From there, jump onto the top of the white chef statue below. Take a gander at the streets, and you’ll easily spot the three red shrubs forming the Mickey Head. The third Mickey Head Lucky emblem in San Fransokyo can only be found during nighttime. So, hop to the third fast travel point. Go to the right, and keep your eye on the tops of the buildings. When you find the one with the huge M on the roof, use the red light to zoom almost to the top. Then, hop onto the building across the street, the one framed by blue neon lights. Turn around and look where you came from. You’ll see a spotlight shining the Mickey Head emblem onto a small billboard that reads Tsukiji & Sons Delicatessen. The fourth San Fransokyo Lucky Emblem is fortunately close by. You have to get to the roof of the building that you climbed to get No. 3 (the one with the M on the roof billboard). Look to the west, and you’ll see statues of three women holding fans. The Mickey Head is on one of the fans. The fifth Lucky Emblem is not too far off. Go to the opposite, east side of the M building, and look north. You’ll see a red light that you can hop onto. It’s the one on the tower with square displays. From there, drop down to the building with the metal dome below. The Mickey Head is on the side of the dome. To reach the sixth Mickey Head in San Fransokyo, head left from the second fast travel point, to the north. Pass the San Fransokyo Tribune, and look west and up. You’ll see a building all in glass, with three fan-like contraptions around it. On the map, it kinda looks like it has a soda can tab on the top. Anyway, climb all the way to the top. You’ll see some air conditioning units surrounded by neon green. The head is right in front of said air conditioning units. The seventh San Fransokyo Lucky Emblem is damned well hidden. Start at the fifth fast travel point. Teleport / climb up the building across the street from you, the cylindrical one, all the way to the roof. Turn around, and you’ll see one of those fan-things. It’s blue, black and white, and has kinda like a fish scale pattern. Use the red light to teleport on top of it. The Mickey head is in the middle of it. Now, for the eight Mickey head, go back to the fourth fast travel point. Walk north, through the parking lot, then hang a left, through the park full of trees with pink flowers. Continue straight on, and keep an eye on the staircase that you’re approaching. The Lucky Emblem will become visible soon enough. For number 9, go back to the fourth travel point. Use the red light on the side of the pyramid-shaped building to jump onto the monorail. Ride it through the tunnel, and jump onto the middle between the two monorails. Turn around, and the Lucky Emblem will be on the tunnel wall on the left. Now, turn 180, and hop down from the monorail to the right. On the street below, you’ll find a small, yellow car under the green Coffee Shop sign. The tenth San Francisokyo Lucky Emblem is embossed on the car door. The eleventh and final San Fransokyo Lucky Emblem, or hidden Mickey Head, is by far the best-hidden one. Start from the fifth fast travel point, and head to the right, or to the west. Use one of the red lights on the pyramid-shaped building to launch yourself up, then, while in the air, focus on one of the lights on the building across the highway. Use the red lights on this building to get to the very top. And I do mean the very top; as in, on top of the antenna jutting out into the sky. The emblem is embossed on the top of the antenna. Happy climbing. If you need further assistance with Kingdom Hearts 3, please check out some of our other guides, like Starting Stats & Classes – What to Choose and Golden Herc Figure Locations – Hercules Collectible. Or, if you’re struggling with finding Lucky Emblems in other worlds, we have you covered for all of them, including Caribbean Lucky Emblem Locations and Lucky Emblem Kingdom of Corona Locations. Hey dude. These are super helpful guides. One quick correction, though. The second emblem is found at the second fast travel point, not the third. Hi, dinahdrake! Super glad that we could help you. As for the second emblem, we’ve accessed it from the third fast travel point, but you can also access it from the second one. It’s the same place; the only difference is whether it’s day or night.